When I use the word Friesian on its own, I am only ever talking about the distinctive purebred Friesian. The famous black horse with its proud neck and head, high stepping gait, its copious mane and tail and its flying feather. As soon as you mix a Friesian with another breed it ceases to be a Friesian, as the studbook is jealousy guarded against outside blood. There are no acceptable out crosses. There are two questions to be answered here. Why would you own, ride, love a purebred Friesian and why would you breed, own, love ride a partbred? As a long time breeder and owner of Friesians I can only say that my reason for being so smitten is not their outward appearance. Without doubt I was first attracted to them by the way they look and I still feel a thrill when I see a Friesian in full flight, mane and tail streaming or catch a glimpse of one in any number of roles in films and TV series, where they are often chosen for their looks and trainability. What has kept me enthralled however is their personalities. The temperament that makes them your best friend and your partner. Their desire to just keep trying to work with you no matter what. I would choose to own a Friesian because they can be as beautiful inside as they are out. 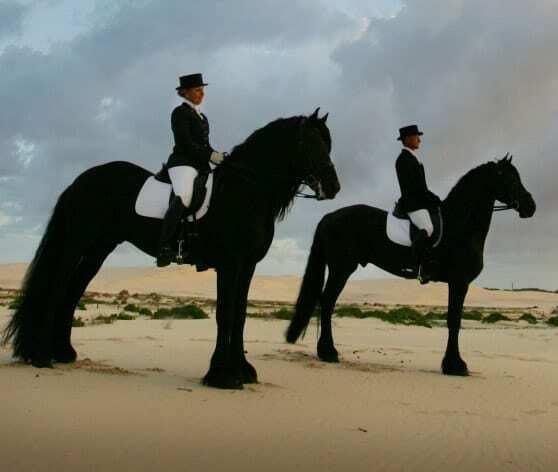 Unlike many “purpose bred” Sporthorses, Friesians were not developed to be specifically a dressage horse though the breeding aims are moving more an more that way, but it is their minds, their traiiability that makes them an excellent partner for someone who wants to enjoy their sport with the minimum of stress. Is every Friesian going to be like this? Well no. I haven’t met one yet that is anything but a sensible, wonderful companion, but not all of them will have that bit extra that makes them a superstar. As with any horse you have to find the special one that has that little bit extra. When you decide to buy one go and see as many as you can, for sale or not. Most of us love to show our horses off. There are different types and most studs have representatives of more than one, some more suitable for carriage work, others more riding types. Make sure you see them or get a video at least, don’t buy them off their papers if a performance horse is what you want. The same rules apply as with any horse, just, well, no Friesian is ever “just any horse”. Friesians consistently pass onto their offspring increased bone, increased luxury of mane and tail and their trainability. What they can gain, depending on the breeding mix, is greater versatility and endurance, more suited to the faster sports, a hybrid vigor from diluting the high inbreeding endemic within the purebreds, and, if that takes your fancy, a colour range. When I breed partbreds it is with a specific goal in mind of the type of horse I want to breed, I am not just breeding a “fake friesian”. My aim with the Indigo Sporthorse is to produce an athletic versatile horses in the Baroque style. Horses with the temperament and ability to turn their hooves to dressage, eventing, working equitation or simply be an all round family horse. For that reason I am concentrating on Friesian, Spanish and Murgese horses with a helping of suitable Warmblood and QH crosses. Some TB will without doubt be in the mix, though not directly. I would choose to own a Friesian because they can be as beautiful inside as they are out.